Last week when I shared the guestroom makeover I said I would share the latest update to the red amoire. Y'all know if I paint a piece once that it just may get painted again. Here are three past looks. Well, at least this time there was no painting. Just lots of sanding. Lots and lots of sanding. Afterall this room is supposed to look like part of an old farm house so the armoire needed to look worn. I love the way the blue color is showing after all the sanding. The good thing about painting more than once is the layers it creates. I replaced the nautical knobs with these from Hobby Lobby found for half price, of course. I think they have a vintage look. Sometimes painting things more than once is a good thing. 1-2015 Post Edit: see the inside transformation here. I'll need to break it to you! Same here. I have painted 1 things 4 times too and in my head, its totally justified. :) So good to see someone similar. Secondly, fabulous job on that one. I love the final look and how the grey shines through the red. And of course, totally adore your living room. Love this room Kim and all the RED...my favorite color! Your hutch it so pretty with all the colors showing through and your new knobs are perfect! You've done it again...such a pretty room! That turned out so nice Kim-looks perfect as a farmhouse piece. It looks fab Kim! I also am digging the new knobs. I need some for our armoire in the living room. I love that how it turned out. A definite farmhouse feel. This room screams cozy!! Very pretty, indeed! I'm getting ready to paint some things this weekend - if the weather is cooperative! Every room needs some red and some black - and a red armoire is perfect! Beautiful Kim, loving the new farmhouse feel. I pinned and shared on FB. 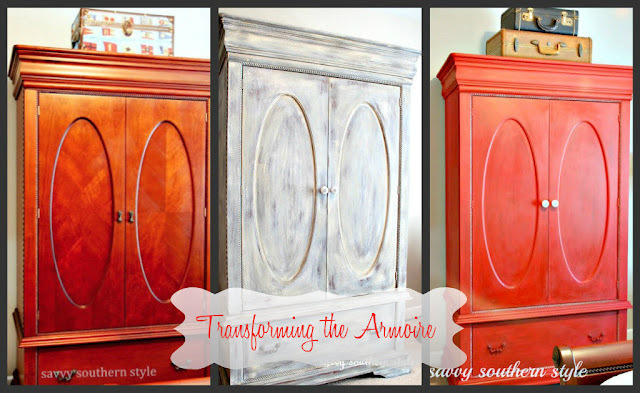 The distressed look of the armoire is perfect for your farmhouse look! Love it! This is my favorite look of the three! Love the layered look Kim! Your guest room is gorgeous! I love what you did with this one Kim, I have yet to try how to do this kind of finish and this is a good inspiration for me. Hope you have a wonderful Mother's day!!!! The layers on that piece really do make the difference. I like the knobs you chose too. That layered look is just perfect for the new farmhouse guest room...great idea to change out the door knobs...yes, they certainly look vintagey!! Love it!! I love how it turned out. And yes, the many layers really do add to the over vintage feel. love the red, and how the past colours are coming through the distressing! The armoire looks amazing. I love how it is a layered look. Very well done. Sometimes you just have to take something away to make it better. You did just that and it's gorgeous. I think this is my all time favorite!! Looks so beautiful Kim! I loved the nautical theme but am loving the farmhouse look! Certainly looks very authentic farmhouse. As it transforms from one color and style to another it gets better and better, Kim! I know, right?! Sometimes I don't get it right until the second or third shot... and then love seeing all the layers through the sanding anyway! That is a great piece and looks great in your room, Kim. I'm also inspired by the cute barstools you use. I'm keeping my eye out for some to paint as they make great little accent pieces, plant stands etc. Oh Kim, I love that look! So fun! What a great update! Looks wonderful~ love the blue peaking through! Another gorgeous painted piece! LOVE the distressed red and your new farmhouse guest room! I love how your home has such a variety of styles/looks, all of which are beautiful! Love the new look to the armoire. It suits the room perfectly! For me the original finish was so pretty I wouldn't have had the heart to paint it unless it had damage, but I am in the process of painting our 3 yr old end and coffee tables white to go with the Fl room. Very rare for me to do as the finish was pristine. Gorgeous! I love the red! It's my favorite color. Kim, it looks great! Please share you tips for sanding in the house in a completely decorated room and not getting dust everywhere! You can NEVER go wrong with red! Love the end result, especially, the aging effect! Looking good! Have you experimented with using steel wool for sanding? I love the the look! It looks amazing!